When Jelani McEwen began his new job as the Charter Support Manager of the Illinois Network of Charter Schools upon graduation from the School of Social Service Administration, in some ways he had come full circle. He started his career at MATCH Charter High School in Boston as a MATCH Corps and AmeriCorps volunteer and then taught at Urban Prep Charter Academies in Chicago. Next, he directed the Issues to Action program at the Mikva Challenge in which high school students engage in civic action projects and community organization within their schools and communities. It was there that he began to put aside aspirations of going to law school and think seriously about becoming a social worker. "I began to realize that the way to accomplish my goal of having a lasting impact in the community was to help repair relationships between residents and the city at large that have been damaged by racism, political corruption, and extreme segregation. Early on in my career I felt that I needed an interdisciplinary approach that blends ecological systems and human development theories in order to deal with the complex social environment that has resulted from decades of oppression and segregation," McEwen says. In SSA classrooms, he found what he was looking for. In discussions led by Professor Deborah Gorman-Smith, he developed a deeper understanding of social supports and interventions for risky behavior. Classes taught by Associate Professor Yoonsun Choi provided skills to measure and evaluate program impacts. "I was able to apply what I was learning in these and other courses to day-to-day challenges in my field placement at Hyde Park High School where I served as a guidance counselor through Youth Guidance's B.A.M. (Becoming a Man) program. It began to make more sense to me how students who have been exposed to risk factors experience school differently. They may be quick to anger because they are impatient with peers and have issues with authority figures in the school. They often struggle to imagine a future vastly different than their current circumstances," McEwen says. McEwen goes on to say that Organization Theory classes have given him invaluable background in how to cope with a tighter grant writing climate based on economic conditions and changes in governmental funding. His second-year placement at the Field Foundation of Illinois gave him a "bird's eye view" of funding and the non-profit environment. "Strategic grant making is a complicated process. I'm so grateful for those who have taken the time to answer questions and offer guidance at my field placements and in my classes. I believe that it's very important that I go on to develop future leaders, especially in communities like those that I come from," McEwen says. One such opportunity came to McEwen when he facilitated a social networking session for male high school students at a seminar sponsored by the Center for the Study of Race, Politics & Culture and the University of Chicago Medicine's Urban Health Initiative, as well as SSA. "Right there in the breakout session, participants from throughout the city of Chicago found peers who provided information on shared interests like a summer sports camp or a safe space to record a song. This was just one of the activities offered during the day-long seminar that were designed to expand their understanding of health. Many teens—particularly black males—think that health is merely about whether you're sick or not. They may need support to build relationships and connect with health care systems that promote physical and psychological well-being," McEwen says. McEwen’s role in the seminar was significant for him in another way because the co-organizer was Associate Professor Waldo E. Johnson, Jr., who had encouraged him to apply to SSA and later became his Foundation Policy instructor. 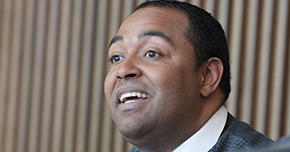 His father, Erwin McEwen, AM ’98, a former director of the Illinois Department of Children and Family Services, had also taken a class with Johnson when he was a student at SSA. "I watched my dad develop his social work career, but when I was growing up I never really considered following in his footsteps. His work is predominately focused on child welfare, while I'm more interested in youth development and education reform. When I was thinking about applying to graduate school, I met Waldo for a cup of coffee. He listened to me talk about wanting to develop innovative school culture practices that will benefit the entire community by matching resources to needs. He suggested that a SSA education could support my dream. As it turns out, SSA has been a big stepping stone for me an opened up a whole new network that will allow me to achieve my dreams," McEwen says.